Skip the lines and check-in early! Join us on Thursday, July 19 from 4 PM to 6 PM at the Hyatt Regency Chicago for the Commemorative Torch Run Pre-Event Check-in. Participants who check-in on Thursday will receive their Commemorative Torch Run shirt early and can proceed directly to the 39th or 31st street beach. Not registered? Walk-Up registration will be available during the Pre-Event Check-In. Registration is $75 and open to the public. Walk-Up Registration will be available beginning at 8:30 a.m. on July 20th at Soldier Field. Registration will be located in the pedestrian tunnel leading from the Waldron Parking Deck. All participants must check-in at the Pre-Event Check-In on Thursday, July 19 or the Registration Table the morning of Friday, July 20. After registration participants should proceed to the Bus Area and take a shuttle to their starting location. Shuttles will run continuously until 10:30 a.m.
All pre-registered participants will receive an exclusive 50th Anniversary Commemorative Torch Run dry-wick shirt. 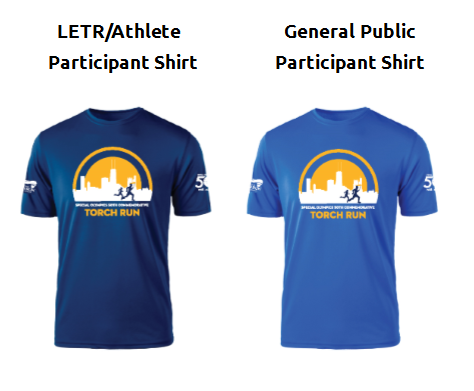 Shirts will receive dry-wick shirts (while supplies last) or a 2018 LETR t-shirt. All participants are asked to wear their provided shirt during the run to help us raise awareness for Special Olympics.